to join us for events. The children have been using headphones as part of the ‘now press play’ programme as you can see from Ellah here – they have been thoroughly enjoying it! Year 5 have been using the outdoors as part of their mathematics work this past week. Some are working at greater depth in some areas of maths already! Friday 29th September from 8.30 – 10.30 and cakes for sale from 2pm to everyone when they leave! Parents are warmly invited to come to this annual fundraiser organised by the school PTA. Please feel free to pop into the community room when you drop children off. Any remaining cakes will be sold at the end of the day from 2pm from the community room. All monies will be donated to the MacMillan Cancer team. when they leave school, and it is not appropriate for school staff to police the area, we have asked for increased patrols in the area. We will be taking photos now and again if we have concerns. Please support the school by making sure that you are not parking on paths, nor on the roundabout. 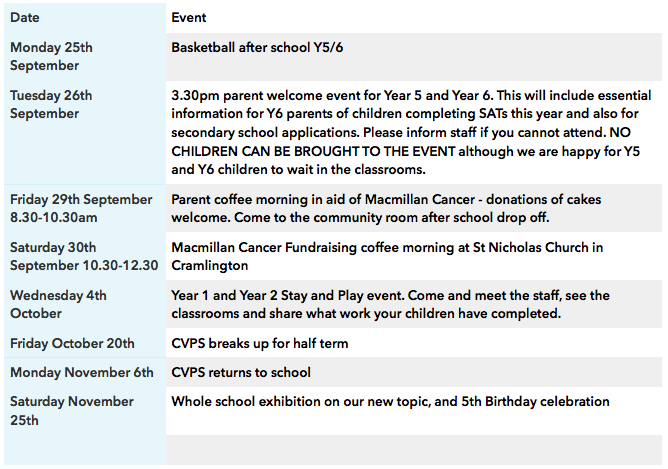 Y1 and Y2 Stay and Play – a chance for parents to visit the children in their classroom and see what they have learned. Congratulations to Y1 who win extra playtime. Many thanks to everyone for their kind words and condolences following the sudden death of my Mum. I shared my experience of the funeral with the children on Monday using age appropriate language and advice taken from the children’s bereavement charity. I know from parents that children have been asking questions at home which I suggested they do. We kept things as upbeat as possible, and the children were as caring as they always are – a credit to you all. It’s important that we prepare them and help them to understand the processes of life and death so it was an ideal opportunity to give time to talking about it. Year 6 have been working on plural possession grammar, mice or mice’s, people’s or peoples? Hope they’ve been testing family at home! Year 5 have been writing formal letters. Year 4 have been writing persuasive letters to seek funding for our mining investigations. Year 3 have been exploring the history of mining in Cramlington extending their knowledge of vocabulary linked to mining and looking at retelling stories from the viewpoint of pit ponies! Year 2 have been composing stories about a steam train, dream train including listening to Now Press Play stories. Year 1 has been developing their knowledge of numbers to 20 using bingo, and odd and even numbers using beans in the sand tray! Early Years classes have been learning from stories about finding friends and continuing to learn the class rules and routines with the theme of who do we think we are! We would welcome any apples to come to school for our Thursday afternoon cooking activities for forest school! We are currently recruiting for a morning cleaner and key holder. This would support the existing team and is a new appointment. Please ask at the school office if you are interested or know someone who can work from 6.30am to 8.30am during term time as a minimum.